With the amount of choice around making a dog food comparison is important for any pet owner who wants to ensure their dog is getting the right kind of food. Buying food for your dog may sound like an easy thing because most supermarkets have a dog food section filled with dozens of different types of. Some owners would just pick anything and leave it at that if their dog eats it while others play it smart by carefully choosing their foods and making nutritious homemade recipes out of them. To find out what your dog truly needs, a dog food comparison should be made to weigh in their costs and health benefits. Dry dog foods are specially made for good health for your dog and usually contain some forms of nutritious ingredients. 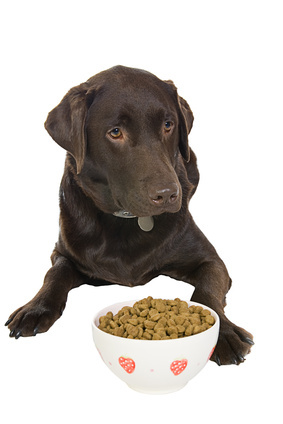 Some choose this type of dogfood because it is less messy and that means less cleanup for the owner. Anyone looking to buy some dry dog food should keep in mind that proper storage is needed to prevent the food from staling and tasting bad. Usually the nutrients and greases found in these dog foods are sprayed making them quite vulnerable to storage heat and bad shipping. The heat can destroy these vitamins and possibly spoil the added grease making it hazardous to your dogs health. Keep your dry foods properly sealed and in a cool temperature to make the most out of dry foods. Unlike the dry foods that come in big bags, wet dog food usually comes packaged in cans or pouches. Wet foods are served moist and juicy for the dog to enjoy. These foods are quite nutritious for your dog because they are specially made by the brands to cater to your dog’s nutritional needs. However, like all canned goods that we occasionally eat, wet dog food contains some unhealthy additives and preservatives that can endanger your dogs’ lifespan if served in large amounts. All the juiciness in the wet food can result to messy meals for your dog to eat. And, when making a dog food comparison most owners would say that a cleanup is more of a chore than having their dog chow down on dry foods. Homemade dog food is a popular choice among people who really care in what goes into their dogs’ mouths. It is true that there are plenty of dogs out there that live perfectly fine without any of the dog foods found commercially in supermarkets and pet stores. Homemade dog food is a sure choice because you get to decide what nutrients go into your dog without any hints of additives. Common choices are raw or slightly cooked meats with brown rice and a little bit of veg on the side. The most difficult thing about homemade food are the choices that you need to make every day in what your dog should eat. Maintaining a balanced diet for a dog can be just as difficult as maintaining a balanced diet for yourself. None of these different dog foods are directly harmful for your dog. With regards to the commercial foods, some can be unhealthy while well-renowned brands can give your dog a good boost in nutrition. Homemade foods are generally better though, as long as they are prepared the right way. By making a dog food comparison you can balance the pros and cons of each type of dog food and serve the right meals for the right occasions.